This is meself and my walking buddy Alan Beirne. 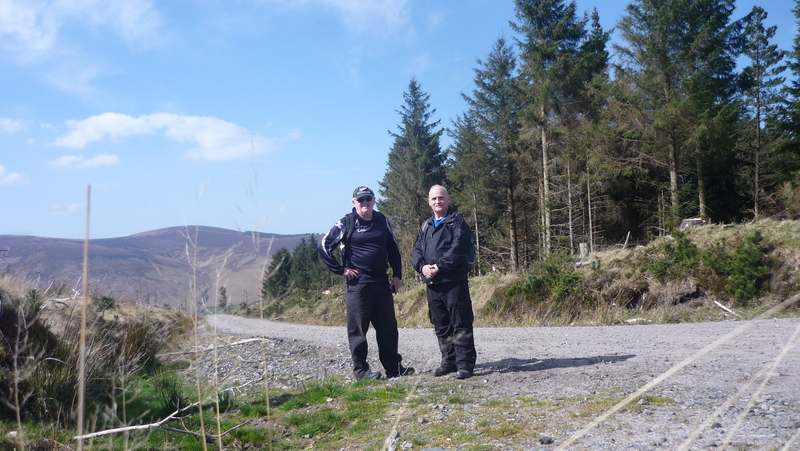 Every now and then we get an itch that has to be scratched and we go walking across the Dublin/Wicklow mountains. This morning we headed off and covered 18 km across the mountains. The morning was bright and fresh, perfect walking conditions and we headed off at a leisurely pace up the first incline. For me the first twenty minutes or so is the tough part until I get my first wind and then I’m grand. There are some beautiful views across Dublin Bay and the coastline leading down towards Bray, Greystones and Wicklow. I was looking out over the city and I’m sure that in the distance I could see the lads on Killala Road playing a game of cards against the roundabout wall. Walking up over the mountains is a great way to spend a day. When I was a little fella I only saw the mountains from the upstairs classrooms in Finbar’s School and now I can walk all over them. Now isn’t that great or what..